Melbourne is the Street Art capital of Australia. The graffiti Melbourne streets are lined with, has never stopped to excite and fascinate me. Quite frequently I stumble across a new piece of art that just makes me stop and look. The great thing about Melbourne Graffiti is that it can grab the eye of most passers by. The rich, colourful pieces are splattered all around the city and most other inner city suburbs, with Fitzroy and Carlton being hot spots for the art. Even if you are not a big fan of it, you can respect the thought and effort that goes into these pieces - along with the love from the artist. I think it just as legitimate as any other art form. Of course, there are people who dont like the graffiti Melbourne is covered in. The paradox is that this vandalism is disliked or perhaps tolerated by the conservative  yet Graffiti artists are paid by the council to share their skill with young people! 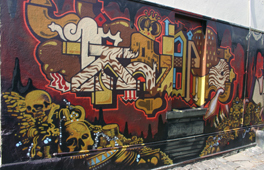 During the history of Graffiti Melbourne was dropped in on by the famous English graffiti and stencil artist, Banksy. He visited our city in 2003 and put up some of his stencils. Although there were many of his pieces around, many have been covered up by other ignorant graffiti artists and council clean-ups. 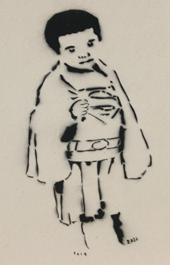 In April 2010, council workers destroyed a little-known piece of Banksys stencil art. The image of a parachute-wearing rat floating down the wall of a building in Hosier Lane was painted over by council workers as part of a maintenance program. 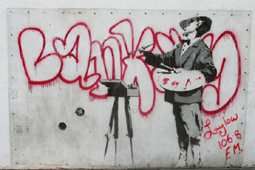 In 2008, on the corner of Swanston and Flinders street in a small lane, a Banksy piece was ruined when a group of vandals poured silver paint in between the plastic protective barrier and the artwork. So, how come a piece of Melbourne graffiti was covered in plexiglass anyway? Street art is not meant to be preserved to maintain its life, it just comes and goes. It is meant to be ephemeral and spontaneous, surviving around the streets and whatever happens in them. And you dont have to be famous to exhibit! If you are looking for good quality graffiti that will keep you wanting more, definitely check out some of the following streets. For the city, check out Hosier Lane, Degraves Street and lots of little lanes and walls around those streets. For Fitzroy, start on Brunswick Street and zig-zag your way through the many streets in between Brunswick Street and Nicholson Street. Prahran is also another graffiti hot spot. Check out Chapel St and many of the surrounding streets around it. These are just the best places to look around, but there are hundreds of little places around the whole of Melbourne that you can check out, just be curious and search and you will find. 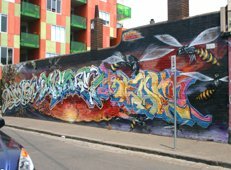 Do you have any photos of Melbourne graffiti? Share them here!